The building located at 44 North Stone Avenue is a two-story structure with a basement area originally built in 1929 and was originally occupied by Montgomery Wards Department Store. 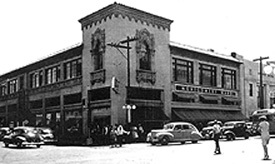 The building was remodeled in 1956 and became occupied by Walgreen’s. The 1956 remodeling removed some mezzanine floor areas, filled in and relocated some interior stairs, and removed a substantial portion of the first floor exterior masonry walls at the Northwest corner of the building, replacing the masonry walls with a window wall system. In the process of this renovation, the original ornamental “cast stone” features were jack-hammered off so that a new building skin could be constructed. Pima County has owned this building since 2004, and it has been partially occupied by various County departments. This project was to restore the building façade to its original appearance to the greatest degree possible with the limited original design documents. With the budget of $943,000, the entire Stone Avenue façade and approximately one-third of the Pennington Street façade was restored. For reasons of budget and practicality, the original sidewalk awnings were not re-created. The University of Arizona College of Architecture and Landscape Architecture has leased the building, providing a major contribution to downtown revitalization.